Webb entered the political arena in 1980 when she was elected to the Colorado State Legislature. She served 13 years in that position. She was the first African American member of the Legislature's Joint Budget Committee (the Legislature's most powerful six-member committee) and thus participated in writing the state's $4 billion budget in 1981. Webb was also active in the campaign to make Dr. Martin Luther King's birthday a state holiday in Colorado. In 1984, the bill she sponsored became law. 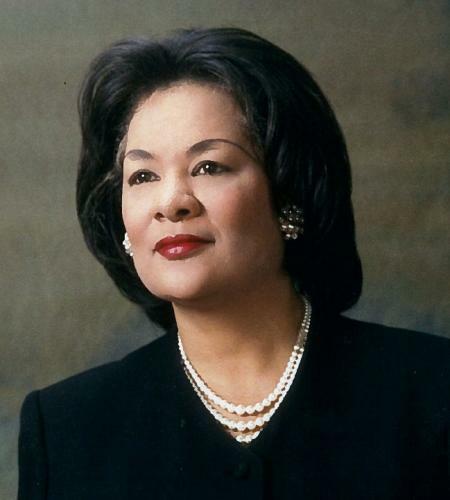 Wilma Webb served as Denver's First Lady for twelve years after her husband was elected the first African American mayor of the city in 1991. In that capacity, she chaired special governmental committees, managed personnel, and represented the City and County of Denver at key public/private meetings and events. In 1997, Secretary of Labor Alexis Herman appointed Webb to serve as the Secretary's representative for the Department's Region VIII where she was responsible for the administration and enforcement of 180 federal statutes governing workplace activities in Colorado, Montana, North Dakota, South Dakota, Utah, and Wyoming. In this position, Webb helped oversee this region's portion of a $37.9 billion Department of Labor budget and its eighteen department agencies. Wilma Webb and her husband, Wellington, are the parents of four adult children. She is also a member of Denver's Zion Baptist Church, the Delta Sigma Theta Sorority, and The Links, Inc.
Wallace Yvonne Tollette, Colorado Black Leadership Profiles (Denver: Western Images Publications, 2001).